This badge was issued to Andrew Nash on 15 Oct 2016. 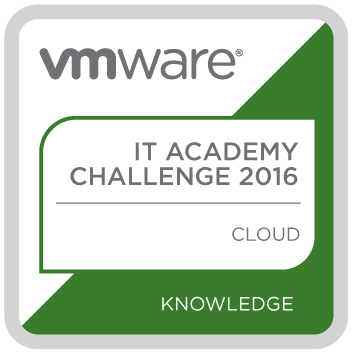 Earners of the VMware IT Academy Challenge: Cloud badge know and understand basic cloud computing concepts, common use cases for cloud technology, VMware Cloud products, and how the VMware Cloud solution meets today's business challenges. Complete a series of activities to learn about cloud computing, including: taking a self-paced online Cloud Fundamentals module, watching several videos, and reading an article on the future of cloud computing in emerging countries. Complete an activity and/or answer "test your knowledge" questions for each challenge task. Total Challenge completion time: 4-hours.